As learners we can sometimes be disheartened by a perceived lack of progress, particularly when we're trying to master a complex and challenging discipline. At our worst, we can feel that haven't made any progress at all--that we've actually regressed and somehow returned to our starting point. The problem may simply be a matter of perspective. We're generally trained to measure progress on a two-dimensional graph that tracks a variable over time--and when things are going well the line moves steadily upward and to the right. But I've come to think of most learning as a spiral process. Our journey as learners takes us along a three-dimensional coil, and we travel both on a cyclical path that returns to its starting point and along a linear axis. This model aptly reflects my development as a coach and a teacher, for example. When I started coaching nearly a decade ago and when I joined Stanford's staff in 2008 I often felt like I was out of my comfort zone, running up against the limits of my abilities. In time those sensations passed, and I came to feel a sense of competence and, at times, even mastery. But those comforting feelings also passed, and once again I felt out of my depth, struggling, challenged. What happened? Why had I regressed? 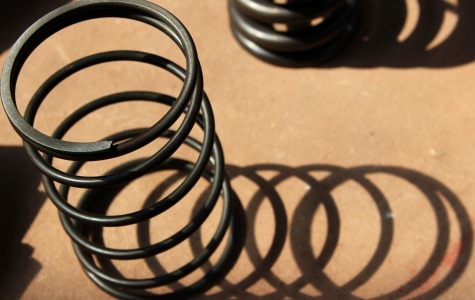 In truth I hadn't regressed, but I had returned to my starting point on the cyclical path. I had completed one loop around the coil, starting at a point where I was being pushed and stretched to my limits, proceeding through a zone where I felt more capable and comfortable, and then returning to that state of struggle and discomfort. If I were to map this path on a two-dimensional graph, it might look disheartening--but that perspective would leave out some critically important data--because the coil is three-dimensional, and as I traveled around the cyclical path, I was also traveling up along the coil's linear axis. And so I wasn't actually at the same spot at all--I had moved up a level, working with my clients and students on more complex and difficult issues, stepping into situations where the stakes were higher, and where more would be asked of me as a coach and a teacher. This process continues today: I jump into something new, and I feel stretched and challenged; then I grow in response, and I feel a sense of capability and calm; and then I push myself again and feel stretched once more. And as I'm repeating this endless cycle, I'm steadily moving up or down the coil's linear axis, generally making forward progress as I push myself, and occasionally backsliding when I shrink from a challenge. The concept of "flow" has been the primary research topic of psychologist Mihaly Csikszentmihalyi (pronounced Cheek-sent-me-high). 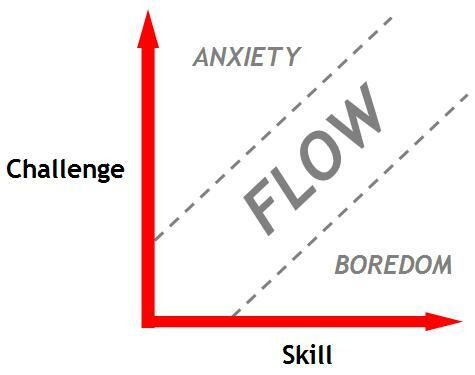 When we chart our mental state during activities that present us with a varying level of challenge relative to our skill--see below--we find that when our skill is substantially higher than the challenge being posed, we become bored. Conversely, when the challenge is substantially higher than our skill, we become anxious. And when the two are relatively balanced, we find ourselves in a state of "flow," where we lose track of time and become fully absorbed in the activity. My cyclical journey along the spiral's coil is similar to the process of tacking my way through Csikszentmihalyi's flow model above. I start out anxious, as the challenge at hand is greater than my current skill level; my skills develop and I enter a state of balance; my skills continue to develop, and I'm increasingly comfortable, to the point of boredom; I seek out greater challenges, passing through a state of balance once more before returning to anxiety. And the cycle begins again. At times I find the concept of "flow" (and the attendant anxiety and boredom) useful in understanding my own learning journey, but there are many times when I don't experience the dramatic loss of self-consciousness and unawareness of the passage of time described in the flow literature. I'm simply moving ahead, consciously, one coaching session, one class, one day at a time. And here the concept of spiral learning helps to remind me that I'm making steady progress in my development as a coach and teacher through these small, daily tasks, even (and especially) when I feel the sense of cyclical return to a state of unease and discomfort. Almost all of my clients and students experience some version of this as well. Having stepped into a demanding leadership role or having been accepted into Stanford's selective business school, they find themselves challenged and stretched on a regular basis, and slowly, eventually, their feelings of discomfort and struggle recede as they become more familiar with the new world around them and the new challenges they face. But then, just when they feel settled and comfortable, those difficult feelings return, and it can be hard to avoid a sense of frustration or even hopelessness at having regressed. Hopefully this simple framework offers a new way to look at our learning and development, one that incorporates the cyclical process of struggle, growth, competence, new challenges, and a return to struggle, albeit on a new, higher level, allowing us to feel a greater sense of comfort with our discomfort. Photo by Jo Marshall. Yay Flickr and Creative Commons.